The Painted King: Art, Activism, and Authenticity in Hawai‘i, by Glenn Wharton, will be among the books receiving this year’s Historic Hawai‘i Foundation Preservation Media Award. The award ceremony will be held on Friday, May 11, 2012, at the Neal S. Blaisdell Center in Honolulu in the Pīkake Room at 4:00 pm. A reception will follow the presentation program. Tickets to the awards ceremony may be purchased for $45 each (HHF members) or $60 (general admission). Visit http://www.historichawaii.org/ for more information. The annual Ka Palapala Po‘okela Awards, presented by the Hawai‘i Book Publishers Association, honor Hawai‘i’s best books, authors, and illustrators. This year’s award ceremony will be held on Friday, May 11, 2012, at 6 pm, at Bishop Museum’s Atherton Halau. A reception and book signing will follow at 7:30 pm., in the museum’s Hawaiian Hall Atrium and Courtyard. Tickets are $25 and include heavy pupu buffet and cocktails, gourmet chocolate truffles by Choco le‘a, and entertainment by Ka ‘Eha. Book sale and author signing proceeds to benefit Bishop Museum. Tickets can be purchased at Native Books/Na Mea Hawai‘i at Ward Warehouse (596-8885). For more information, email aloha@hawaiibooks.org. 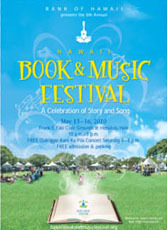 University of Hawai‘i Press will be among the local publishers participating in this year’s Hawai‘i Book and Music Festival this weekend, May 5–6, 10 am–5pm, at Honolulu Hale. Admission and parking are free to the general public. To view a complete and updated list (PDF) of sale books by discount, then title, click here. Or simply go to our website, www.uhpress.hawaii.edu, and start shopping! *While supplies last; orders are nonreturnable. To view a complete list (PDF) of sale books by discount, then title, click here. Or simply go to our website, www.uhpress.hawaii.edu, and start shopping!